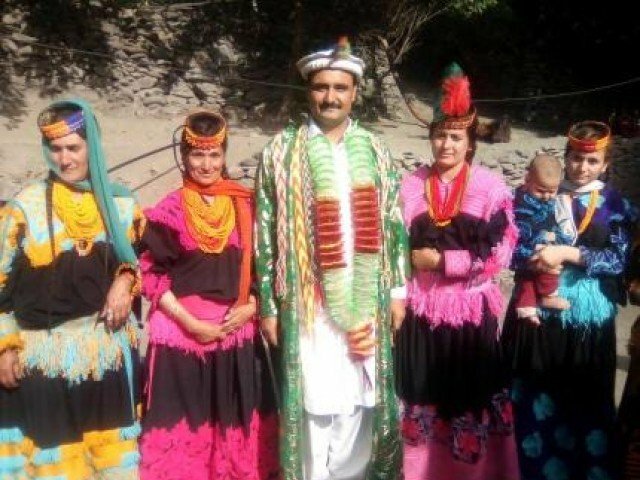 PESHAWAR: As the results came in for the general elections 2018, Kalash people in Rumbur valley on Saturday celebrated the victory of Pakistan Tehreek-e-Insaf (PTI) as it paved the way for the selection of their native youth Wazirzada as a member of the Provincial Assembly (PA) on a minority reserved seats. A known social worker of the area, Wazirzada, is hailing from Kalash tribe, was nominated for one of the two minority seats, and will be the first Kalash person to be part of the PA in Khyber-Pakhtunkhwa after his party’s resounding return to the assembly. The name of Wazirzada stood second on the priority list submitted to the election commission, and his party had the required strength of general seats to assure he will be seated in the house. People from the other two valleys of Bumburate and Birir thronged the valley to participate in celebrations which would continue for three days. “It is an achievement of the Pakistan Tehreek-e-Insaf,” Dr Tariq Muhammad Adnan told APP, adding that he specially came from aboard with his family to cast his vote in favour of PTI. “It was a significant day for the Kalash people as one of them has been nominated by a political party for the assembly seat,” he added. He said that his village had celebrated with a lavish dinner. The ceremony was also attended by MNA-elect Abdul Latif and Wazirzada, and special Chitrali caps were presented to them by the elders of the Kalasha tribe. Najma, a Christian girl from the area, termed the nomination of people from the Kalash tribe to the centre and province as being a way to address the deprivation of Kalash people residing in Chitral district. Najma said the victory of PTI is matchless and she is sure that problems in district Chitral, which had been neglected in the past, would be addressed on priority basis.